Jewish Coalition Presidential Candidates Forum in Washington, Dec. 3, 2015. Joel Leyden, 56, is by all accounts an avid Donald Trump supporter. The international media consultant and journalist, who splits his time between New York and Israel, has even started a Facebook page called “Jews 4 Trump,” which has more than 7,000 likes, along with a Twitter handle that has more than 1,300 followers. “He’s done a fantastic job. The man is a marketing genius,” Leyden said during a telephone interview this week. But for Leyden and many other Jewish-Americans, the Republican presidential front-runner’s recent remarks about Muslims echoes the earliest days of Nazi propaganda in 20th century Germany. The controversy could jeopardize Trump’s following in the Jewish community, a small but promising voting bloc for the GOP. Trump has made a number of incendiary statements along the campaign trail about Hispanics and women. But Trump’s campaign press release Monday “calling for a total and complete shutdown of Muslims entering the United States until our country’s representatives can figure out what is going on” struck outrage among people of all races and religions around the world. And his refusal to call Jerusalem Israel’s undivided capital at the Republican Jewish Coalition’s presidential forum last week offended Jewish voters in the U.S. even further. For decades, the Jewish community has been a reliable voting bloc for Democrats. In recent elections, however, the Republican Party has stepped up efforts to corrode that allegiance. In the 2012 presidential election, Jewish support for the Democratic Party plunged 9 percent while support for the GOP increased by the same amount. Unless he modifies his statements on Muslims and Jerusalem, political strategists said Trump could chip away at any and all support from Jewish conservatives. Leyden, who has volunteered extensively for Trump’s campaign in New England, has posted on the “Jews 4 Trump” Facebook page and Twitter account, urging the businessman-turned-politician to clarify his proposed ban, as well as his position on Jerusalem. Leyden also raised the issues in the “New Hampshire For Donald Trump” Facebook page, which he created specifically for Trump’s campaign. The campaign on Thursday took down the New Hampshire page, which had reached nearly 10,000 likes, saying the posts questioning the remarks on Muslims and Jerusalem were “trashing Trump,” Leyden said. Leyden commended Trump for postponing this week a planned trip to Israel, which has a sizeable Muslim population, after Israeli Prime Minister Benjamin Netanyahu condemned his proposal to ban U.S. travel for all Muslims. 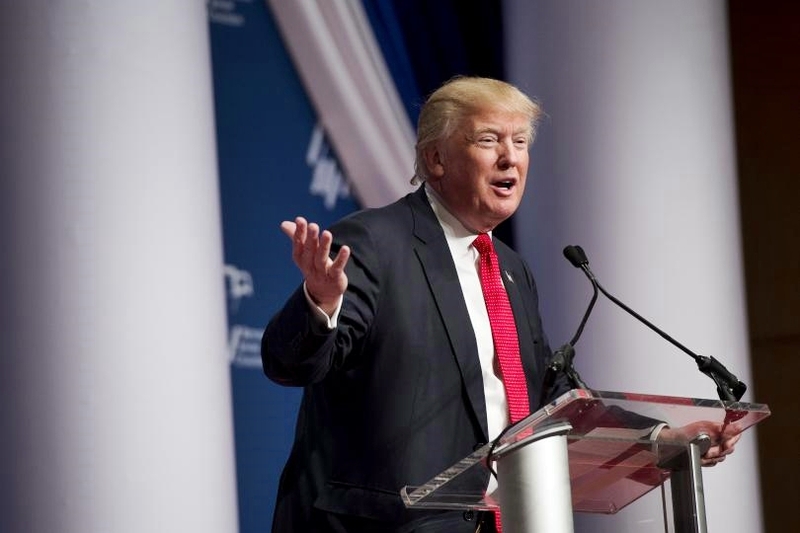 Trump must now retract or revise his remarks on Muslims and Jerusalem, Leyden said, otherwise the presidential hopeful will lose his vote and those of many other Jewish-Americans. Other Jewish-Americans are taking Trump’s comments less seriously. Brian Sherman, a member of the “Jews 4 Trump” Facebook group, dismissed any parallels between Trump’s invective against Muslims and Adolf Hitler’s hatred for Jews. Sherman, who said he has many Muslim friends, argued Trump often says things he doesn’t mean or fails to clarify his statements. The California resident said he was particularly drawn to Trump because of his fiscal policies, which vow to slash taxes for the poor and the wealthy. Although he also disagrees with the proposed Muslim ban, Sherman said he plans to vote for Trump if he wins the Republican nomination. Trump’s positions on immigration and national security are not meant to be hateful, Sherman said, but rather aim to enhance anti-terrorism efforts. Rabbi Bernhard Rosenberg in Edison, New Jersey, said comparing the presidential hopeful to Hitler was “ridiculous.” Rosenberg recently stepped down from his congregation to build support for Trump in the Jewish community, launching his own “Rabbis for Trump” campaign.